Market analysis studies the attractiveness and dynamics of market. Market analysis gives us the information about how the market is performing and what should we expect from the overall market situation. The knowledge of where the market is headed to is very important for making an investment decision. The market analysis aims to represent the overall position of the economy. If the overall market is expected to enhance, then the expected increase in the stock can be found by using the stock’s returns and historical sensitivity with the market returns, which gives an idea how the stock will move respective to the market movement. If the market is expected to go up and the relation between investment-stock is positive, then the stock is most likely to give more returns. 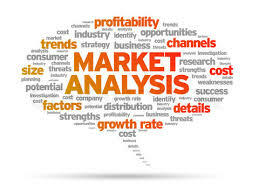 In a market analysis, the analysts should take into account the economic, legal, political, sociocultural, and competitive measures, with regard to the market size, growth rate, and the profitability ratios respective to the business. If the economic conditions are good in a market, then the consumer confidence would rise, which would lead to the higher consumption of goods and services in the market leading to the overall higher profits for the companies. These factors give us prediction as to where the market is expected to head, which can lead to a better investment decision i.e. Recently European legislators have relieved the emission status of the cars, the ease in the restriction has allowed the auto makers to sell such vehicles in the Europe, which were previously banned due to higher harmful gas emissions. This ease leads to the good news for the automotive industry, which will be reflected in the returns of such companies. Investment strategies have also placed importance on the market analysis. The top-down approach to the investment decision-making starts with the market analysis, in which the market conditions and expected returns are forecasted, leading to the industrial analysis and then the company analysis within the industry. The top down investment strategists believe that the company’s performance in future does not depend solely on the company but depends on the overall economy, industry regulations, and outlook as well. Market analysis becomes more important if the investor is planning to invest in the foreign markets. The market outlook helps investor determine where the specific market is going i.e. the growing middle class in Asia leads to higher investments in growing markets because of the expected increase in the performance of companies there. Emerging markets have given very good returns in the recent years much better than the developed markets because of the increasing consumption power of the middle class in such countries. The market analysis as a whole gives us a holistic view as to where the particular economy is going and an analyst can connect such expected trends to the companies, which gives good idea as to where the high growth is expected in the industry and then in companies leading to smart and more profitable investments.